Another poor performance puts K's in the bottom four and club's patience runs out. Given how quickly after the final the whistle the board acted, it was almost certainly pre-determined that Tommy Williams would be sacked if Ks lost to Burgess Hill Town. The defeat - a sixth on the bounce - brought to an end a nearly three year reign for Williams and his assistant Graham Harper. Mainly it had been characterised by mid-table frustration - the good runs always punctured by a bad result, the worrying slumps always arrested with a good performance quite out of the blue. Last year's triumph in the Alan Turvey Trophy perhaps papered over some cracks but even if Ks never looked like going up, until recent weeks they never looked like going down either. On-field stability brought some peace of mind, if not exactly a sense of excitement, while off-field matters have dominated the mind. But suddenly since Christmas, that middling form crashed into a dramatic and worrying slide - talk of relegation flying almost week-by-week through the spectrum of a joke, a bit of a joke, a possibility and a probability before reaching the point of being a near certainty if Ks didn't do something to arrest their worst run of form in recent memory. Even in the ill-fated 2004/05 season under Scott Steele's management and the Khoslas' ownership, Ks never went ten games without a win as they have now. Williams was popular as both a player and as a person, and if Ks avoid the drop then that may well remain his legacy at the club. But that is now in Craig Edwards' hands rather than his own. Williams' last grasp at turning Ks' form around got off to an inauspicious start. Before we'd even made it into the ground - delayed by Southern Rail offering only a replacement bus service to Burgess Hill, our inability to finish games of darts and pool in decent time and then a slow pizza order - the Hillians were in front through Lucas Rodgrigues after Ks failed to clear a corner. Ks won about half a dozen first half corners but none of them, nor indeed any other move, led to a shot on target or a clear-cut chance. In fact the home side looked far more like doubling their lead, Pat Harding forcing Rob Tolfrey into two good saves, one after Rodrigues teed him up and one at full stretch from a fierce 20-yarder. Almost straight after the break Rodrigues forced Tolfrey into another save and the game continued to drift until Ks equalised quite out of the blue on the hour mark, Alan Inns heading a long free kick into the box over goalkeeper James Shaw. But if that was to be Ks' lifeline it was short-lived. Burgess Hill retook the lead just five minutes later when Charlie Wassmer misdirected a Rodrigues cross past the stranded Tolfrey. Rather than offering any threat in the last 25 minutes Ks mainly spent it looking bewildered, only Tolfrey impressing when he made another fine save in stoppage time to deny Tyrell Richardson-Brown. Around an hour later, the club parted company with Williams and his assistant Graham Harper. Whether Edwards can stop this slide of form in the six remaining games will now determine whether it also parts company from the Ryman Premier as well as Kingsmeadow in four weeks' time. Burgess Hill Town: James Shaw, Ibrahim Diallo, Leon Redwood, Toby Pointing, Cheick Toure, Sam Fisk, Pat Harding, Pierre Hazet, Lee Harding, Aaron Smith-Joseph, Lucas Rodrigues. 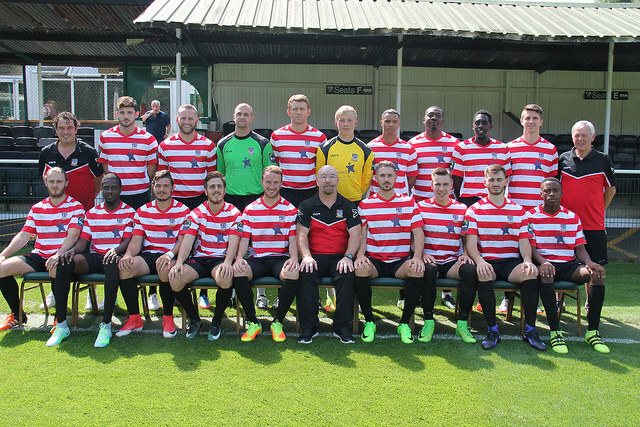 Kingstonian: Rob Tolfrey, Jordan Gibbons, Keir Dickson, Lee O'Leary, Charlie Wassmer, Alan Inns, Joe Turner, Shaun McAuley, Ryan Moss, Pelayo Pico Gomez, Charles Banya. Subs: Sam Page, Sean Bonnett-Johnson (for Shaun McAuley, 77m), Youssef Bamba (for Pelayo Pico Gomez, HT), Lewis Taylor (for Charles Banya, HT), Tom Derry.